Members of the Research Centre for Photonics & Instrumentation received their award during the Royal Society's Diversity Conference. 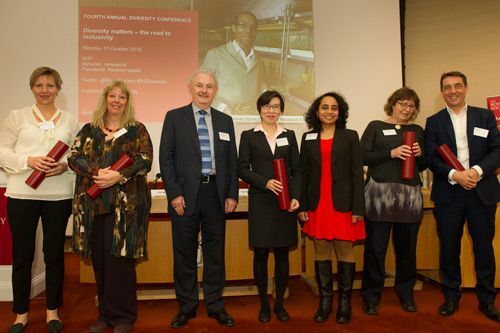 Professor Tong Sun, Professor Ken Grattan and Dr Arti Agrawal, represented the Research Centre for Photonics & Instrumentation, in receiving the runner-up award for the Royal Society Athena Prize 2016, during the Royal Society's Diversity Conference on 31st October 2016. The Centre, of which Professor Aziz Rahman is also a constituent member, (he was on an academic visit in China on the day of Conference) was cited as ‘acting as a role model for inclusiveness by promoting good practice and addressing cultural barriers both nationally and internationally’. The inaugural Royal Society Athena Prize 2016 recognises individuals and teams in the UK research community who have contributed towards the advancement of diversity in science, technology, engineering and mathematics (STEM) in their institutions and organisations. The Prize aims to inspire innovation and leadership in diversity issues and is awarded biennially (in even years) for individuals or teams, working in UK academic and research communities, who have contributed most to the advancement of diversity in science, technology, engineering and mathematics (STEM) within their communities. The Royal Society Athena Prize 2016, comprising a medal and a £5k gift, was awarded to the London Mathematics Society’s Women in Mathematics Committee, recognised for introducing a broad range of initiatives in the field of mathematics resulting in a change of culture that has happened nationwide in mathematics. Professor Valerie Gibson for her impact on the culture at the Cavendish Lab in Cambridge and at CERN in becoming more accepting of life beyond work and in the introduction of a child policy; Dr Mateja Jamnik for founding women@CL an initiative targeted at computer science which has started to change the culture in computing departments nationwide; Dr June McCombie, MBE, FInstP, FRSC, FRAS for being the key instigator and first Chair of the Institute of Physics’ Juno Programme; and, Professor Paul Howard Walton for making an impact through promoting evidence based thinking in equality and as a prominent spokesperson for equality in academia. The European Organization for Nuclear Research (French: Organisation européenne pour la recherche nucléaire), known as CERN, is a European research organization that operates the largest particle physics laboratory in the world. Established in 1954, the organization is based in a northwest suburb of Geneva on the Franco-Swiss border, and has 22 member states.